Playing four days after an imprecise overtime win at NC State, the Virginia basketball team had a Bill Murray in Groundhog Day type of performance against Miami on Saturday at the John Paul Jones Arena. The Hoos, playing without starting guard Ty Jerome, struggled to string together any offensive consistency, but still prevailed 56-46 to remain undefeated at home. They’ve won 11 or more home games in a season for 10 straight seasons. The Cavaliers seemed uncertain of the specific root causes for a shaky week compared to their usually high standard of play, but welcomed a chance to rest and then refine things in practice. The Hoos are taking two days off following Saturday’s win before returning to preparation for Duke on Saturday at the JPJ. The unsteady performance perhaps was most reflected in the turnovers category for the second straight game. After committing 16 turnovers in Raleigh, a return to the home court didn’t provide relief. The Cavaliers coughed up 14 more turnovers against Miami with four players logging at least 2 turnovers each. Freshman Kihei Clark, who started in Jerome’s place, committed 6 turnovers in what was an up-and-down day for him. Clark posted 9 points, 6 assists, and 5 rebounds as the counterweight to those miscues. UVA leads the country with just 8.8 turnovers per game so that makes the back-to-back double-digit turnover outing all the more striking. Virginia had a three-game stretch earlier this year with double-digit turnovers against Marshall (16), Florida State (11), and Boston College (11). On the other hand, the Hoos have also had just 2 turnovers twice this season against Maryland and Notre Dame. The offense’s inconsistency extended beyond turnovers. UVA made 22 of 52 shots for 42.3% shooting on the day. 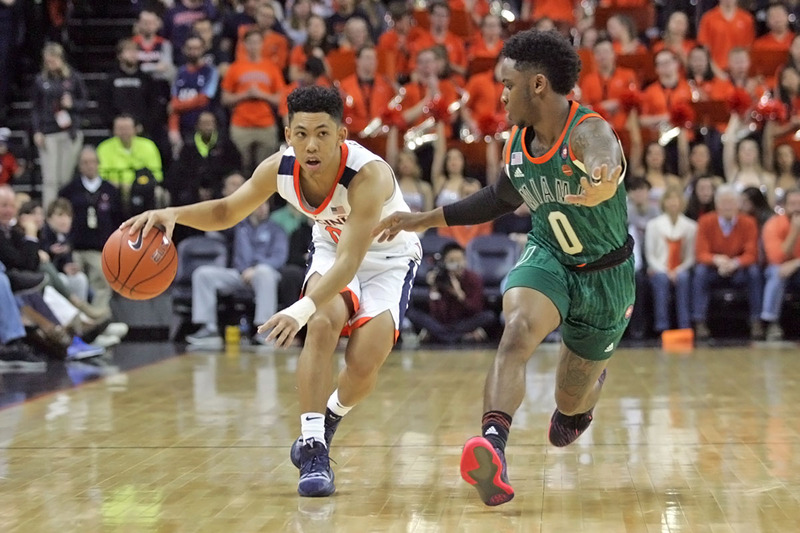 The Hoos were a little better in the second half than the first with 45.8% shooting vs. 39.3%, but they never really pieced together possessions of sound offense consistently. Virginia used a ball screen heavy offense for much of the contest, but the combination of good ball pressure from Chris Lykes and Zach Johnson as well as Miami flooding the paint area near the free throw line to make it hard to see or feed the screening player rolling to the basket caused problems. Plus, the Cavaliers seemed hesitant to make some potential passes at times and that further bogged down the rhythm of the offense. Throw in some missed shots from rolling screeners or post-ups after rolling into position near the blocks, especially early in the game, and it was enough to kick things out of sync. In the end, UVA put three guys in double figures. De’Andre Hunter led the Hoos with 14 points on 6-of-13 shooting to go with 5 rebounds, 2 assists, 2 steals, and 1 blocked shot. 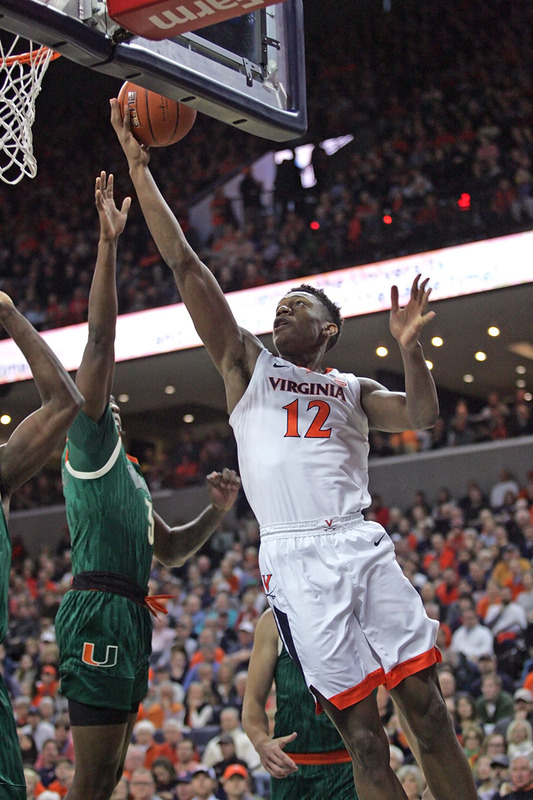 Mamadi Diakite added 11 points, 6 rebounds, and 3 blocked shots, much of which came during the win-clinching moments over the final 8 minutes after Miami closed to within 45-39 on the scoreboard. Guy tallied 10 points, 4 rebounds, 3 assists, and 1 steal to join that duo in double figures. The Cavaliers also got the aforementioned 9 points from Clark plus 7 points and 9 rebounds from Salt. Braxton Key put together a line of 5 points, 8 rebounds, 4 assists, 2 steals, and 2 blocked shots to help the winning cause. That included a nifty quick-touch alley-oop for the second straight game, this one going to Diakite behind the Hurricanes’ defense. It proved to be enough offensively thanks to a solid, though not exceptional, effort defensively. The Hoos held Miami to 34% shooting (17 of 50), including a rough 19% shooting from 3-point range (4 of 21) and were helped by an 8-of-15 showing at the free throw line. Lykes led all scorers with 16 points on 5-of-13 shooting, but he dished out only 1 assist. Johnson and Sam Waardenburg added 10 points each, while Ebuka Izundu had 8 points and 11 rebounds. The Hurricanes managed to beat the defense for some easy buckets at times, but Virginia blocked 6 shots to erase some of the other breakdowns defensively. Plus, Miami managed just 5 offensive rebounds and that limited second chance opportunities despite the poor shooting day.